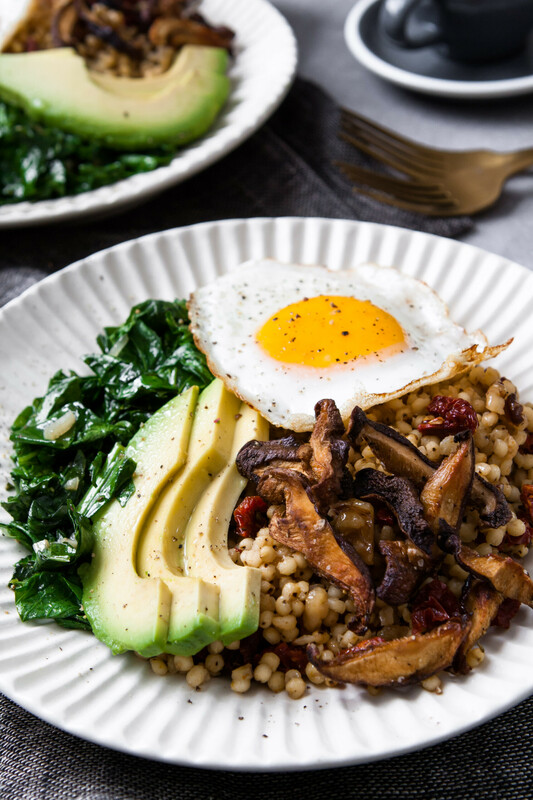 A simple savory breakfast bowl featuring garlicky greens, fragrant sun-dried tomatoes, whole-grains and crispy shiitake mushrooms. Topped with avocado and an over-easy egg, this is one healthy and flavorful breakfast. I much prefer a savory breakfast over a sweet one. For some reason I think it sets me up for a successful day of healthy eating. The power of positive thinking, right? 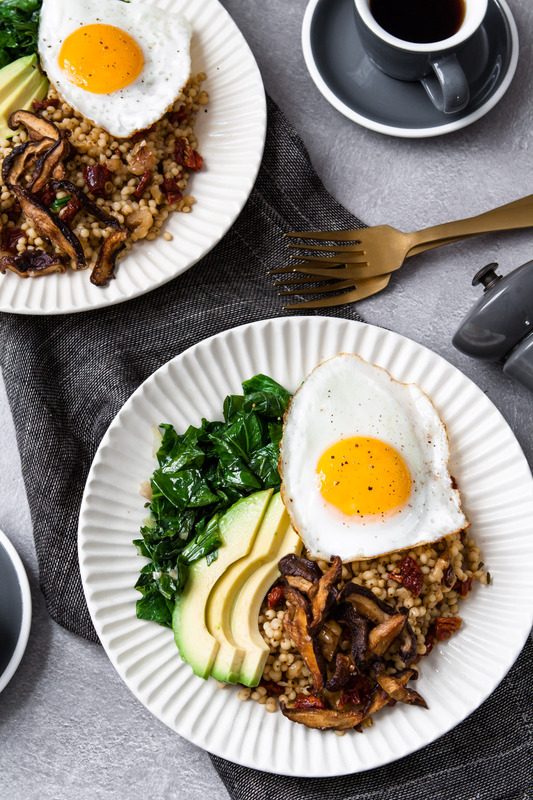 My go-to is a fried egg and a piece of toast, but this breakfast bowl is quickly taking its place. 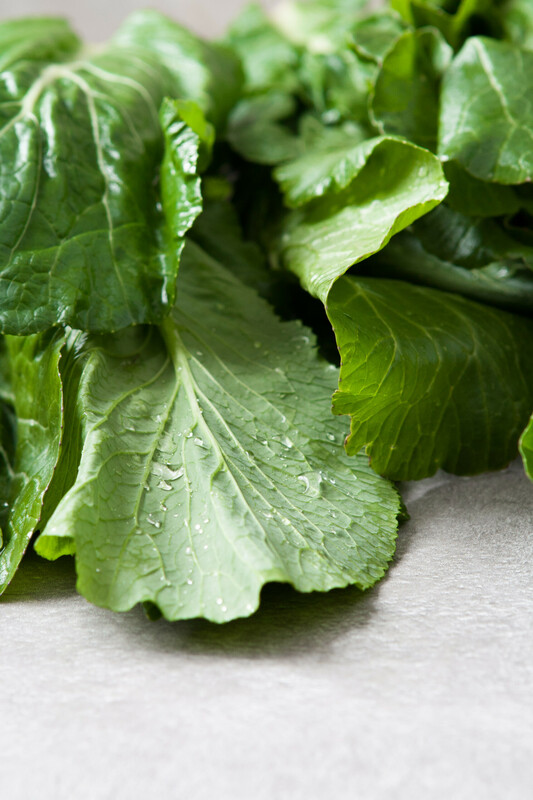 Since the sun-dried tomato pilaf can be made ahead of time, all that’s needed it a quick sauté of winter greens and the cooking of an egg to get breakfast ready. It’s flavorful, satisfying, and perfect for a cold morning. 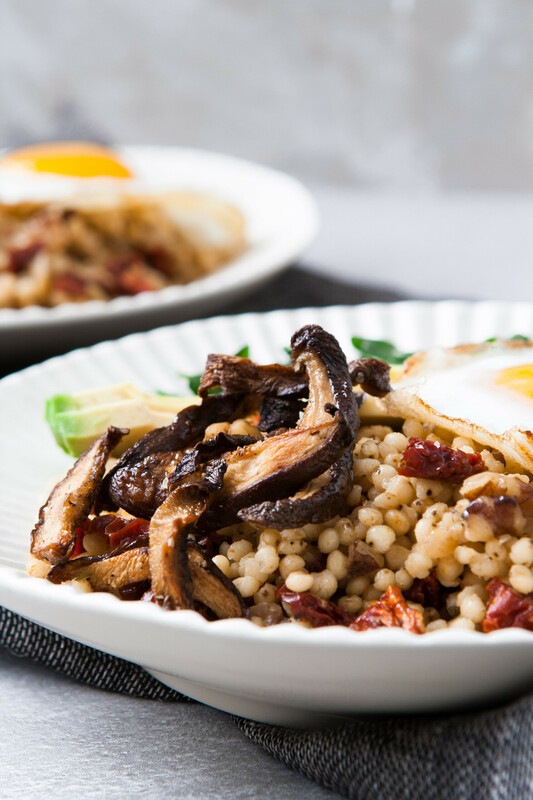 Plus, this bowl is packed with whole grains and is gluten free—thanks to NuLife Market! 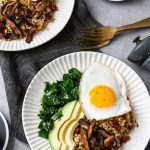 I love using their pearled sorghum when I’m looking for a meal that’s healthful, yet satisfying, and comes together quickly. If you can’t find or don’t have sorghum, simply swap in dry quinoa, faro, bulgur, or freekeh in place of the sorghum. Just be sure to adjust the broth and cooking time according to package directions. It’s been a bit of a cluster to get this recipe in front of you, as this past week was somewhat of a whirlwind. Thanks to my clumsy, forgetful mind I lost my wallet last Monday after grocery shopping which then ensued a massive wallethunt that lasted more than two hours and required more than a quarter tank of gas. I even called in reinforcement in the form of G — rather he called himself in — and still no luck. To the DMV I went and the beginning of a week-long sabbatical from spending money. The not spending money was a good thing, the rest was just downright frustrating. The silver lining? I had just bought all the groceries I needed for the week and for three recipe tests. Positive thinking. What I slowly came to realize throughout the week was that if we just open our eyes (we might not lose our wallets … just a thought), there’s a lot of helpful, kind, and patient people in the world. Aside from a few rambunctious individuals at the DMV or coffee shops who won’t help you replace a $100 gift card you just bought (and subsequently lost), I see you Spyhouse Coffee, there is a lot of kindness in the world. I think this past, turbulent, year of insane politics, obvious aggression, and technology- and social media-obsessed culture has clouded our vision. I’m not here to say those things don’t exist, because you and I both know they do. But they seem to crowd our viewfinder, leaving no room to see the beauty and kindness that’s still present in our communities. Nearly every person I spoke with — whether it was the teller at the DMV, police officer over the phone, or the person from my bank — was gracious and empathetic. The common denominators? Kindness and positive thinking. It’s the gentleman at the DMV who gave me his number instead of throwing it away and walking out, the police officer who shared his own story of driving away with his phone on his roof, and the bank employee who asked me about Zestful Kitchen and what I do. Acting and thinking positively, instead of inconvenienced, made for more enjoyable and genuine interactions throughout the whole process. Needless to say, I’m working on positivity and gratitude. 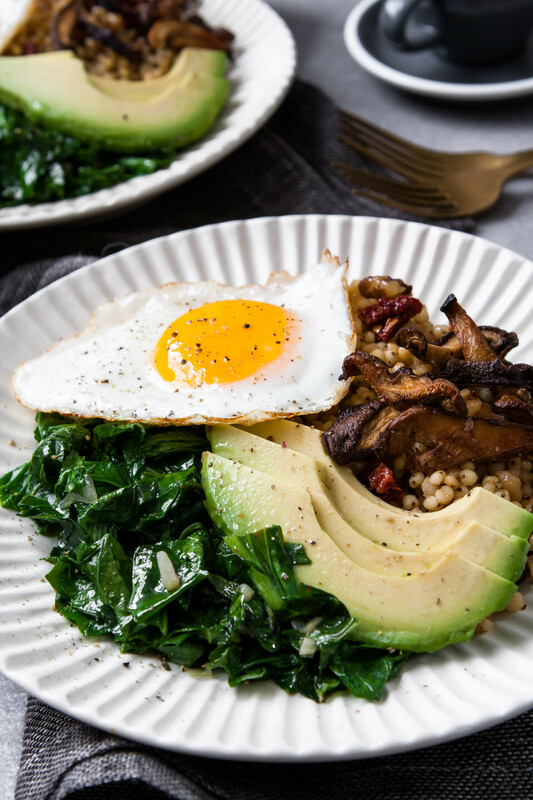 A simple winter breakfast bowl featuring garlicky greens, fragrant sun-dried tomato sorghum, and crispy shiitake mushrooms, topped with avocado and an over-easy egg, this is one healthy and flavorful breakfast. Cook onion in 1 teaspoon oil in a saucepan over medium heat until softened, 3 minutes; season with salt and pepper. Add ½ teaspoon rosemary, zest, and sorghum and cook 1 minute. Add broth (or water), bring to a boil over high for 5 minutes, then reduce to a simmer over medium-low, cover and cook until grains are tender and liquid is nearly absorbed, 35–40 minutes; drain if needed. Off heat, stir in sundried tomatoes and walnuts cover and let stand 10 minutes. Meanwhile, toss shiitakes with 1 teaspoon oil; season with salt and pepper and arrange in a single layer on a baking sheet. Roast shiitakes until crisp, 25 minutes, stirring halfway through. Heat 1 teaspoon oil in a regular or cast iron skillet over medium. Add garlic and ½ teaspoon rosemary and cook 1 minute, add greens and cook just until wilted, 1 minute. Off heat, season with salt and pepper. 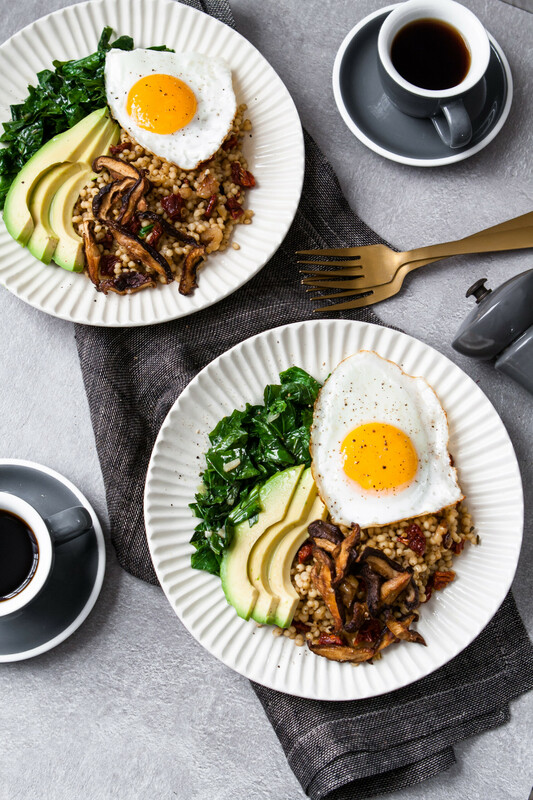 Divide sorghum and greens among two serving bowls, top each with one or two fried eggs, sliced avocado, and crispy shiitakes. Season with black pepper. To get this bowl together quickly, prepare the sorghum and sundried tomato mixture in advance. Transfer to an airtight container and refrigerate until ready to serve. Reheat in the microwave or on the stovetop with a splash of broth of water. You can also make the crispy mushrooms in advance, although they will need a few minutes in the oven to re-crisp just before serving. Store in an airtight container. Use dry quinoa, faro, bulgur or freekeh instead of the dry sorghum. Adjust the broth and cooking time as needed according to package directions. This looks so yummy and your pictures are just drop dead gorgeous. Thanks for sharing – I love a good savory breakfast too! Looks delicious! I really need to cook with sorghum more! Thanks Kelly! I love sorghum! The perfect way to start the day. This looks incredible! Thanks for sharing!